Observation - Caterpillar - UK and Ireland. 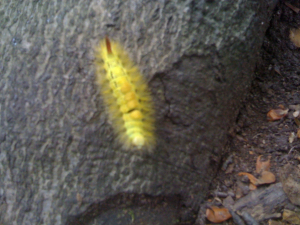 Description: Yellow-green caterpillar about 2cm long with red spiked tail. It's a bit out of focus but I am sure someone will recognise it please. Yellow-green caterpillar about 2cm long with red spiked tail. It's a bit out of focus but I am sure someone will recognise it please.